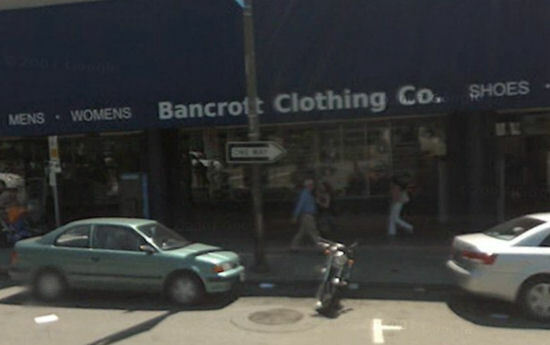 Bancroft Clothing Co. is a retail store offering Mens apparel, Womens apparel, Shoes, Clinique and University of California at Berkeley, collegiate licensed Cal products in Berkeley, California. We offer the largest selection of licensed Cal products at the best competitive prices. We have been voted by the Cal students: "Best place to purchase Cal gear" per the Daily Californian Newspaper. We are located at 2530 Bancroft Way, Berkeley, Ca 94704 across from Sproul Hall at the Berkeley campus. Our store hours are Monday-Saturday 10:00-6:00. Sunday 11:30-5:30. Click on the picture below to go to Google street view.